Parisian fashion designer Paul Poiret had already had success with his “Hobble Skirt,” an item that lived up to its name, being very tight around the ankles and actually hobbling the wearer. 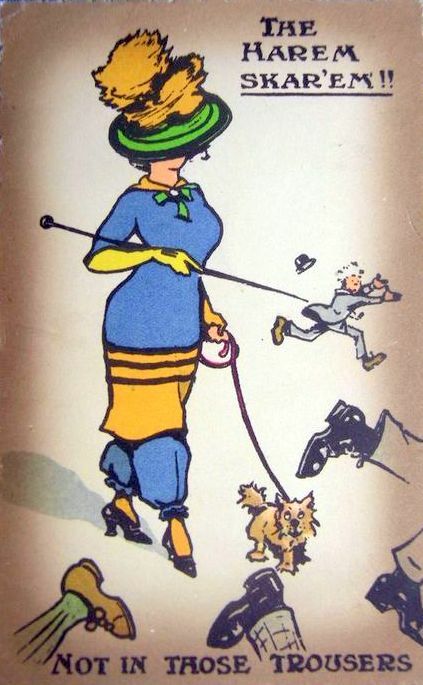 Although this silhouette was very much in vogue, women kinda still wanted to be able to actually walk. So Poiret presented the “Harem Skirt,” or “Jupe Culotte,” having a similar tapered silhouette, but divided by a slit so the wearer had freedom of movement. Period photographs of the “harem skirt” show a variety of types of clothing but all show women with visible “pantaloons” underneath. 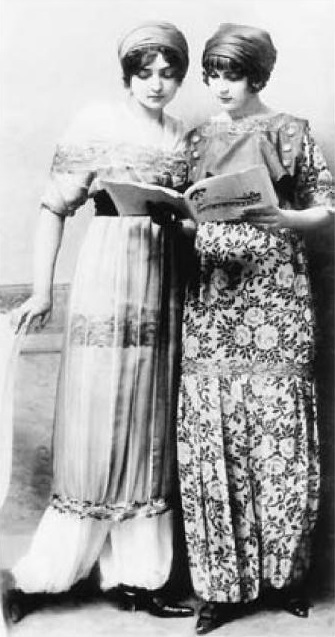 Poiret’s inspiration was the clothing worn by Turkish women. Today Poiret might be criticized for his orientalism and cultural appropriation. At the time the style was regarded as inappropriate because of its ‘sexuality’ and the fact that it was ‘mannish.’ It was the visible “pantaloons” that freaked people out. A woman’s legs. In pants. In Public. Stop the presses. Newspapers reported on women who ventured into public wearing Harem skirts and were “mobbed,” as well as attempts to pass legislation prohibiting women from appearing in public in the garments. 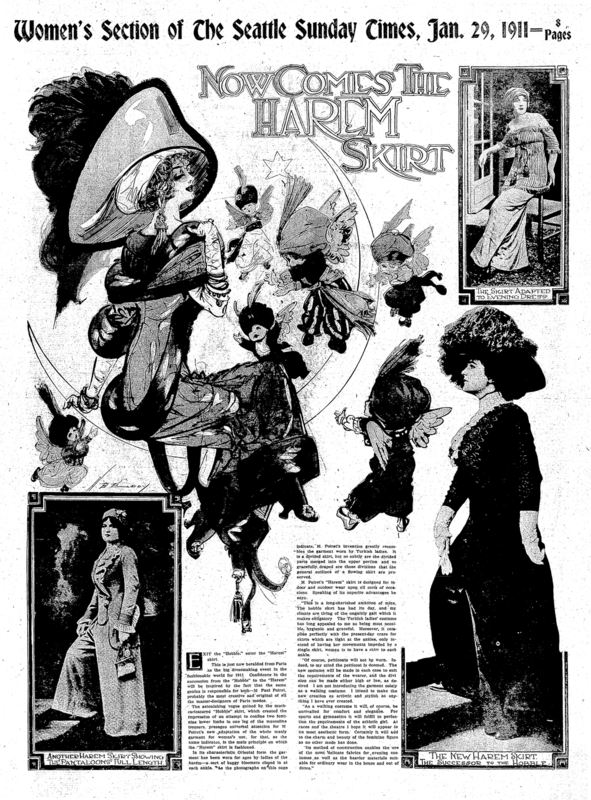 By May of 1911, the Harem Skirt made its first appearance in little ol’ Bellingham. Two young ladies modeling skirts from Kaufman Brothers store on West Holly ventured outside and the sidewalks became “well-nigh impassible” before concerned Citizen Ed Sterne “arrested” the girls and escorted them back to the store. French "Jupe Culotte" know in English as "Harem Skirts." 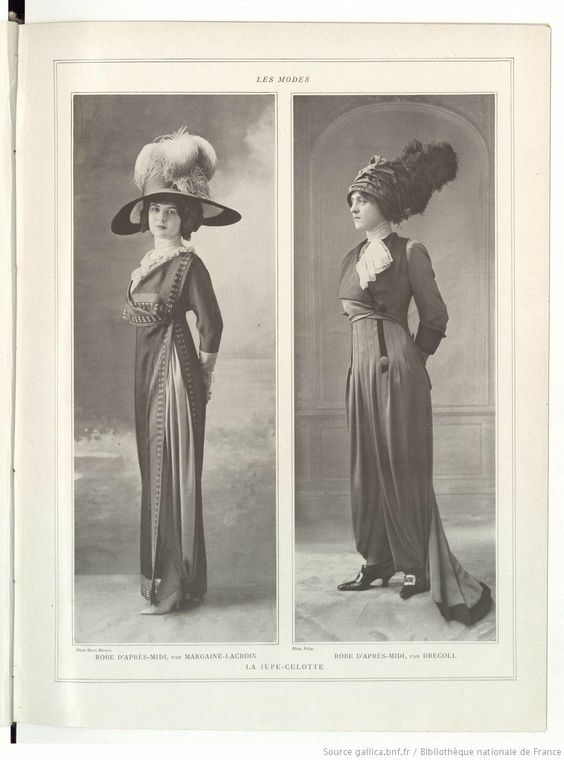 Paul Poiret's earliest "harem" fashion, appears more co-opted than reverent to our modern eyes. The "Hoble Skirt" predated the "Harem Skirt" and was clearly limiting to a woman's range of motion. The Seattle Daily Times introduced the latest fashion in a full-page spread in the “women’s section” in January of 1911. 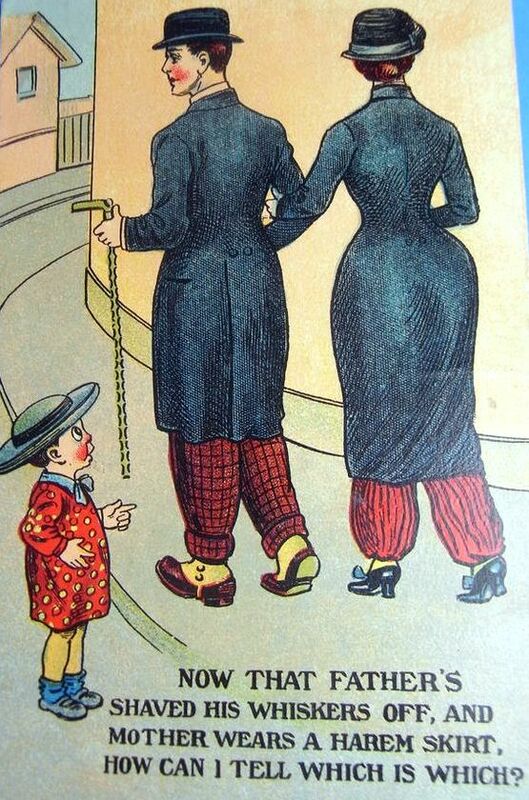 Cartoons and postcards from the 1910'S poked fun at the Harem skirt and the craziness that ensues when women dress like men. 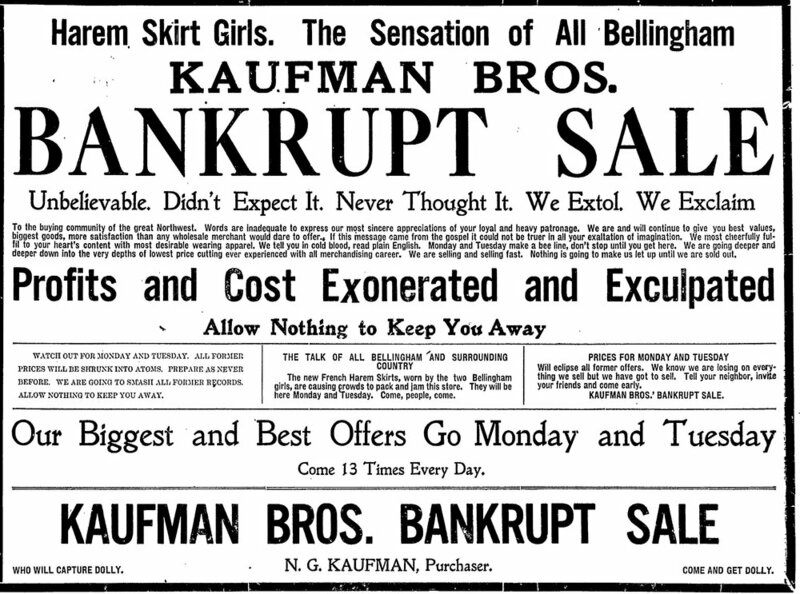 Kauffman Bros. department store (located at the current site of Wild Buffalo on Holly Street) had already filed for bankruptcy when they ordered Bellingham's first 'trousers for women.' The store capitalized on the negative publicity from the citizen's arrest of two young women in their closing sale advertisement. Newer PostVintage Furs... Made in Bellingham!